For questions and inquiries click here to input your contact information. Elevate Your Brand to Your Target Audience! Sponsorships boost sales with precision messaging. 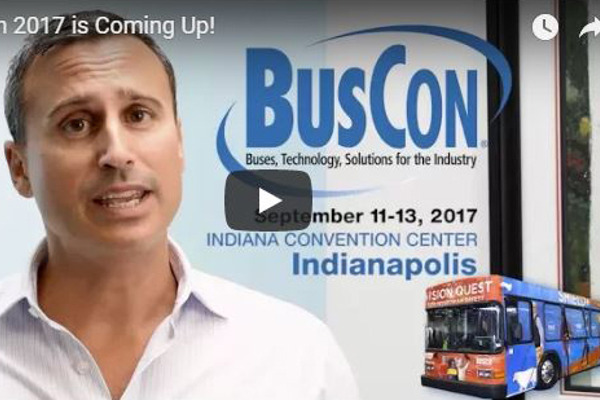 Increase your visibility at BusCon by taking advantage of one of many opportunities designed specifically for exhibitors to reach a wider audience and increase booth traffic. See below for packages, a-la-carte and Mobile App options. When it comes to BusCon’s sponsorship opportunities, the possibilities are endless. Key sponsorships go fast! Reservations will be processed on a first-come, first-served basis. Call today to discuss additional ideas to make your company stand out! Sign up early to sponsor BusCon 2019 to get nearly one million impressions! Over 150,000 Direct Mail impressions. Over 200,000 Internet promotion impressions. 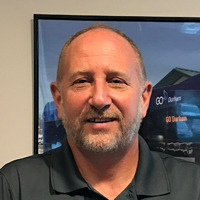 Please call James Blue, General Manager, Bus & Rail Group at (310) 533-2449 or email [email protected] for more information or to discuss customization. 20'x20' exhibit space. Includes booth drape, carpet and 7" x 44" company identification sign. Ten complimentary full registration passes to distribute to your best customers or to use for additional exhibitor/staff passes. ($1,850 value). Inside front cover premium placement of your full page, 4-color ad in the official pocket guide ($1,250 value). One dedicated email promotion featuring your participation at BusCon to be sent out to all preregistered attendees ($2,000 value). 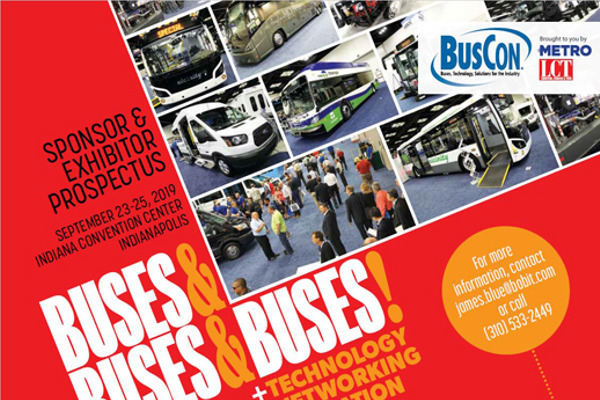 Website banner (300x250px) on the inside pages of BusConExpo.com ($2,500 value). 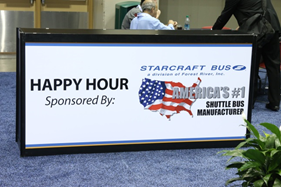 Logo in the sponsor section on www.BusConExpo.com with a link to your website. Company logo in “Diamond Sponsor” category on all pre-show print and email promotions. Company logo and link on the exhibitor list on the show website. Logo in the “Diamond Sponsor” category on the show entrance unit and signage pertaining to sponsored items. Post-show attendee roster with badge information including name, company, city and state. Enhanced Mobile App Listing: Company logo, description and link and opportunity to load PDF sales materials. Happy Hour on the Show Floor (Exclusive) ($12,000) Receive prominent exposure in the exhibit hall at the exclusive BusCon Happy Hour at the last hour of the first day of the show. Sponsorship includes hosted bar, music entertainment, acknowledgment on the website and in the event guide. Logo on signage at Happy Hour, logo napkins and the opportunity for servers to wear sponsorprovided logo wear. Monday Evening Reception (Exclusive) ($12,000) Be the exclusive sponsor for the Monday evening reception the evening before the show opens. Includes logo on signage, custom logo napkins and the opportunity for sponsor to provide logo glasses or cups and servers to wear sponsor-provided logo wear. 10'x20' exhibit space. Includes booth drape, carpet and 7" x 44" company identification sign. Eight complimentary full registration passes to distribute to your best customers or to use for additional exhibitor/staff passes. ($1,480 value). Full page, 4-color ad in the official pocket guide ($1,250 value). Company logo in “Platinum Sponsor” category on all pre-show print and email promotions. Logo in the “Platinum Sponsor” category on the show entrance unit and signage pertaining to sponsored items. 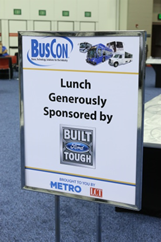 Lunch Sponsor ($7,000) Exclusive sponsorship of the Tuesday or Wednesday lunch inside the BusCon exhibit hall. Includes acknowledgment on the website and in the event guide. Logo on signage at food area, and opportunity for servers to wear sponsor-provided logo wear. Badge Lanyards ($7,000) Seen on the neck of every attendee. Make sure it’s your logo they see associated with the show. This is the ultimate in achieving brand awareness. Opportunity to insert sponsorprovided advertisement behind badges. Registration Sponsor (Exclusive) ($7,000) As the exclusive registration sponsor, your logo is the FIRST company attendees see when they arrive at the show. Your logo is included on all registration signage and counters on-site, as well as on-line attendee registration, printed registration forms and on-site registration forms. Includes the opportunity for sponsor-provided collateral (specific size) to be included with badge mailing to pre-registered attendees. Show Bags (Exclusive) ($6,500) Your company’s name will be seen everywhere with your logo prominently placed on one side of the tote bags carried by all attendees during (and after!) the event. Six complimentary full registration passes to distribute to your best customers or to use for additional exhibitor/staff passes. ($1,110 value). Company logo in “Gold Sponsor” category on all pre-show print and email promotions. Logo in the “Gold Sponsor” category on the show entrance unit and signage pertaining to sponsored items. Branded Phone Charging Station ($4,500) Place a custom electronic charging station in your exhibit space and drive traffic to your booth. One unit will have four charging stations for almost all types of electronic devices. Includes power and your company graphics for an excellent branding opportunity. Event Pocket Guide (Exclusive) ($3,000) Premium exposure in the pocket guide. Your logo will appear on the front of the event program, and you will receive an upgrade to a full page 4-color ad on one of the cover pages. Session Chair Covers ($4,500) A great way to get your company noticed. Your company’s logo will be prominently placed on all chair backs in the BusCon Seminar rooms. 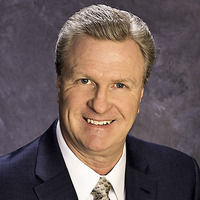 Awards Breakfast Sponsorship ($4,000) Your company brand will appear front & center in Wednesday’s Awards Breakfast on the podium, room signage and you will have the opportunity to place your company collateral on the table tops. Up to 5 minutes of podium speaker time is available for the sponsor of the Awards Breakfast. Sponsor logo on signage at breakfast and food areas, and opportunity for servers to wear sponsorprovided logo wear. Official Aisle Sign Sponsor ($4,000) Prominently display your company logo on each of the fifteen (15) aisle signs in the BusCon Exhibit Hall. 10'x10' exhibit space. Includes booth drape, carpet and 7" x 44" company identification sign. Four complimentary full registration passes to distribute to your best customers or to use for additional exhibitor/staff passes. (Additoional passes $600 ea.). Half page, 4-color ad in the official pocket guide ($750 value). Company logo in “Silver Sponsor” category on all pre-show print and email promotions. Logo in the “Silver Sponsor” category on the show entrance unit and signage pertaining to sponsored items. Official Registration Pens ($3,000) BusCon will place your pens in the attendee bags and at the registration area for attendees to use for registering on-site. 1,000 Pens with your company logo will be provided by BusCon. Directional Signage Sponsor ($3,500) Your company logo will appear on all directional signs for the event. Attendees will see your logo prominently displayed as they look for a session or event. (does not appear on signs pertaining to other sponsored items or events). Web Banner (limited availability) ($2,500) Custom web banner (sponsor-provided art, 300x250px) to run on the inside pages of BusConExpo.com. Mobile App Banner $2,500 and up Choose a watermark on “My Schedule” page, secondary launch page or banner. Subject to availability. Two complimentary full registration passes to distribute to your best customers or to use for additional exhibitor/staff passes. (Additional passes $600 ea.). Company logo in “Bronze Sponsor” category on all pre-show print and email promotions. Logo in the “Bronze Sponsor” category on the show entrance unit and signage pertaining to sponsored items. Exclusive Directional Floor Stickers $2,500 Put your message throughout the exhibit hall, in the most visible place: the floor! Direct attendees to your booth with custom printed floor stickers. Ten (10) floor stickers provided by BusCon. Pre- or Post- Show e-promo (limited availability!) $2,000 Get a customized message out to registered attendees before the show – draw traffic to your booth and be ahead of the game. 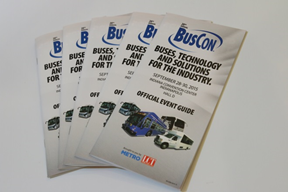 Dates are depending on availability and can be selected within one month prior or one month after BusCon. Branded Conference Notepads $2,000 Attendees will need something to write on. These notepads will be in every room. Meter Panel Graphics $1,500 (1), $3,000 (2) or $4,500 (4) Put your message on display on doublesided, 39"x96" four-color signs in the main registration foyer. That’s eight feet high! Put your message on display on double-sided, 39"x96" four-color signs in the main registration foyer. That's eight feet high! Receive excellent exposure in the exhibit hall at the exclusive BusCon Happy Hour at the last hour of the first day of the show. Sponsorship includes hosted bar, music entertainment, acknowledgement on the website and in the event guide. Logo on signage at Happy Hour, logo napkins and the opportunity for servers to wear sponsor-provided logo wear. Be the exclusive sponsor for the Monday evening reception the evening before the show opens. Includes logo on signage, custom logo napkins and the opportunity for sponsor to provide logo glasses or cups and servers to wear sponsor-provided logo wear. Bring the event schedule into the palm of the attendees’ hands with the official BusCon smart phone mobile app! Exclusive sponsorship of the Tuesday or Wednesday lunch inside the BusCon exhibit hall. Includes acknowledgement on the website and in the event guide. Logo on signage at food area, and opportunity for servers to wear sponsor-provided logo wear. 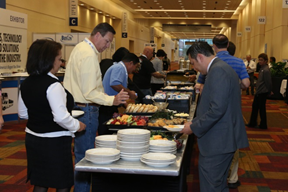 As the exclusive registration sponsor, your logo is the FIRST company attendees see when they arrive at the show. Your logo is included on all registration signage and counters on-site, as well as on-line attendee registration, printed registration forms and on-site registration forms. Your company’s name will be seen everywhere with your logo prominently placed on one side of the tote bags carried by all attendees during (and after!) the event. Seen on the neck of every attendee. Make sure it’s your logo they see associated with the show. This is the ultimate in achieving brand awareness. Opportunity to insert sponsor-provided advertisement behind badges. Place a custom electronic charging station in your exhibit space and drive traffic to your booth. One unit will have four charging stations for almost all types of electronic devices. Includes power and your company graphics for an excellent branding opportunity. A great way to get your company noticed. Your company’s logo will be prominently placed on all chair backs in the BusCon Seminar rooms. Premium exposure in the event pocket guide. Your logo will appear on the front of the event pocket guide, and you will receive a full page 4-color ad on one of the cover pages. 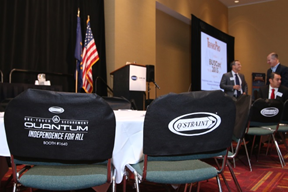 Your company brand will appear front & center in Wednesday’s Awards Breakfast on the podium, room signage and you will have the opportunity to place your company collateral on the table tops. Up to 5 minutes of podium speaker time is available for the sponsor of the Awards Breakfast. Sponsor logo on signage at breakfast and food areas, and opportunity for servers to wear sponsor-provided logo wear. BusCon will place your pens in the attendee bags and at the registration area for attendees to use for registering on-site. 1,000 Pens with your company logo will be provided by BusCon. Your company logo will appear on all directional signs for the event. Attendees will see your logo prominently displayed as they look for a session or event. (does not appear on signs pertaining to other sponsored items or events). Put your message throughout the exhibit hall, in the most visible place: the floor! 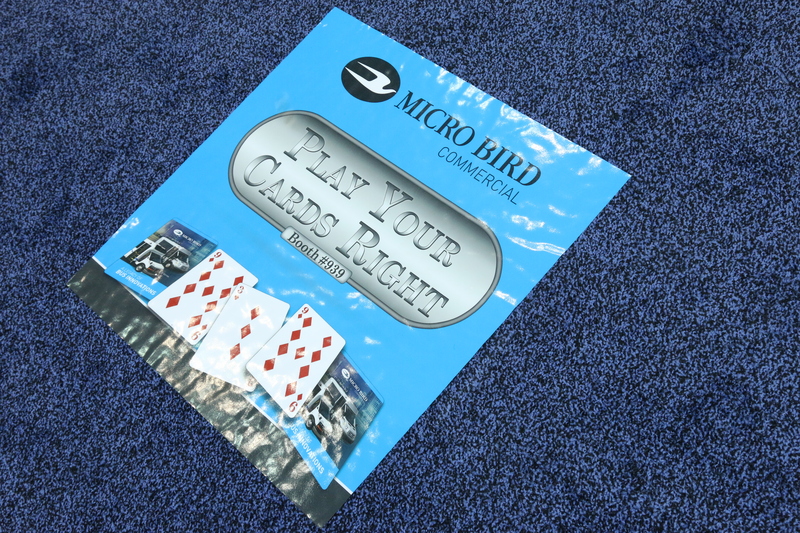 Direct attendees to your booth with custom printed floor stickers. Ten (10) floor stickers provided by BusCon. Place your linked company’s logo or an animated banner on the home page of the BusCon website and receive several months of pre-show promotion! Reach your target audience before they get to the show, so they make appointments to stop by your booth. We will keep your banner on our website for an additional 3 months after the show ends. Get a customized message out to registered attendees before the show – draw traffic to your booth and be ahead of the game. Or reach them post-show (includes on-site registrations) and thank them for visiting you. Dates are depending on availability and can be selected within one month prior or one month after BusCon. 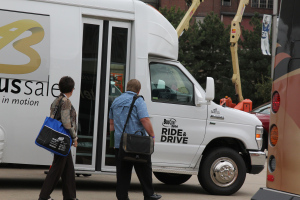 Your company will have the opportunity to offer attendees a test ride in your new vehicles exclusively at BusCon, before they make the big decision to purchase from you! 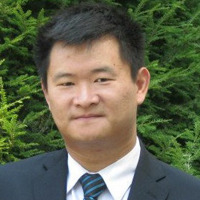 Includes on-site signage urging attendees to participate at two specific times each day of the show and be a part of a shared dedicated epromo to pre-registered attendees. Put your message on display on double-sided, 39” x 96” four-color signs in the main registration foyer. That’s eight feet high! 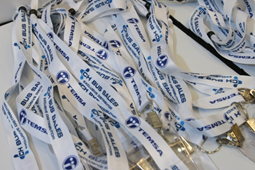 Have your company’s promotional item placed in the hand of every attendee. 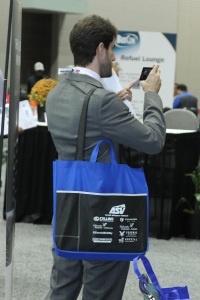 All attendees will receive a highly desirable show bag and you can place your literature or promotional item inside each bag (no pens please). Distributing your company item will allow a marketing impact that continues after BusCon is over. 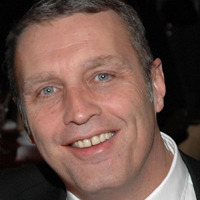 Organize a meeting with your customers and/or staff. Rental is for a 2-hour period per room, and on a first come-first serve basis. Audiovisual, catering and other special requests are the responsibility of the exhibitor/sponsor. Time and location will be subject to approval by show management. *Participating company’s staff rooms must be booked at the BusCon headquarters hotel, the Westin Indianapolis in order to qualify for meeting room rental. Attendees will need something to write on. These notepads will be in every room. Prominently display your company logo on each of the fifteen (15) aisle signs in the BusCon Exhibit Hall. A watermark of your logo will appear on all "My Schedule" calendar pages of the Mobile App. Make the first impression to BusCon attendees. This page will appear after the opening screen and will showcase your custom graphics on the Mobile App. Banner ad will rotate more frequently at the top of the mobile app dashboard page. Sponsor can choose to link the banner to a customozed landing page or multimedia message. Banner ad will rotate at the top of the app dashboard page and click through to a multimeda video message provided by the sponsor. Banner ad will rotate at the top of the app dashboard page and click through to a custom landing page provided by the sponsor. Drive traffic to your booth! Send a text alert to all attendees who have downloaded the app.